There is no denying that Olympia is an artist’s town. Inspired by the beautiful scenery, the inspiring landscape and the moody weather, artists flourish at the base of the Puget Sound. Whether it is the murals on buildings downtown, the art installations along the boardwalk, or the numerous art walks and events around the region each year that celebrate creativity, artists here have an incredibly supportive community that embraces their works. 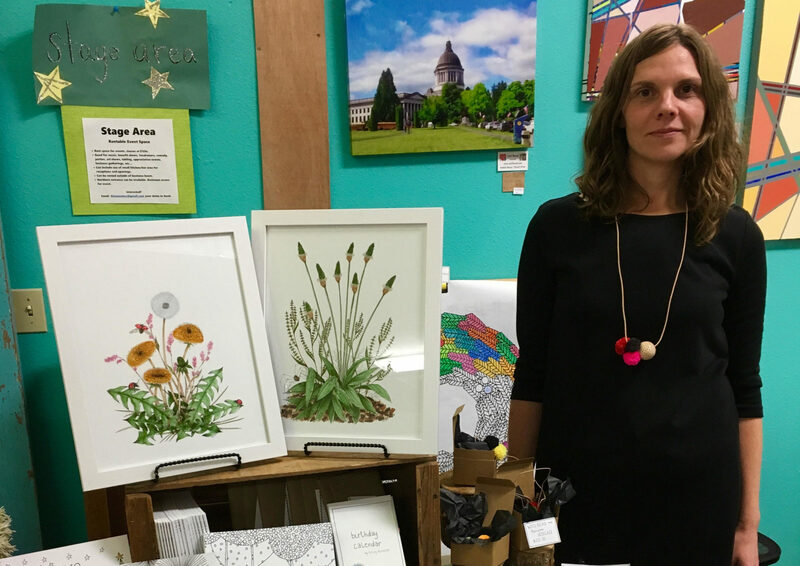 Because of the supportive climate and freedom of expression the town gives to artists, longtime Olympia resident Trixy Eichler is one of those that Olympia has supported. In return, Trixy is giving the region beautiful, inspired drawings in her own awesome and unique style. Trixy is as Pacific Northwest as they come. Growing up in the small town of Birch Bay, right along the Washington/British Columbia border, nature has been a cornerstone in her life. As a child, she would look at Mount Baker, walk barefoot along the water, and explore the forests and fields around the community under the shadow of the Peace Arch. It was also during her childhood that she found a connection with art. Trixy finds beauty in nature at all sizes. It wasn’t until high school that Trixy came to realize her love of art was something more. In high school, she had an art teacher named Rob Gischer who was the first person to tell her that she had talent, and she held onto that. Mr. Gischer helped Trixy put together a portfolio so she could apply to art schools, helping her get accepted into two. She chose Cornish College of the Arts in Seattle. After college, Trixy spent time in South Africa with an organization called Mercy Ships, and had the incredible opportunity to work with an art therapist, something that she had never thought of before. It was on this trip that she met her husband, who moved to the United States from Germany so that they could begin their life together. Trixy and her husband relocated in Seattle, where Trixy continued to work on her art as a hobby. Eventually moving to Olympia in 2007, they ran a retail store called Einmaleins. At Einmaleins, Trixy used her creativity in the store, designing window displays, product displays and more, helping to solidify her art as a cornerstone to her personality. After a handful of years, the Eichlers made the decision to close the retail store they had opened together. The closing of the store forced Trixy into a place where she needed to figure out what her next steps were going to be. 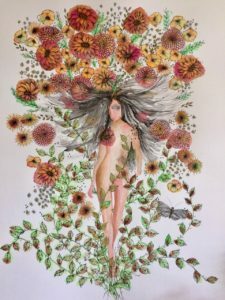 It was then that she discovered artist Lisa Congdon, who had an online course on becoming a working artist. She signed up for the class and it was an amazing experience, inspiring her to make a commitment to doing a drawing a day. This course was the jolt of encouragement Trixy needed to help commit herself to an art practice. 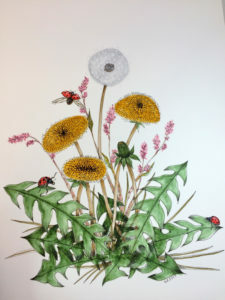 Since the course, she has been drawing for four solid years, creating a great body of work. She also is helping inspire new generations to find their artistic voices. Trixy’s artwork can be found all around Olympia and the West Coast. She currently has work at Gallery Boom in downtown Olympia. A little over a year ago, she also participated in a show that she found through Instagram, called #cautionmaybehot hosted by Fayes Video, a coffee shop in San Francisco. 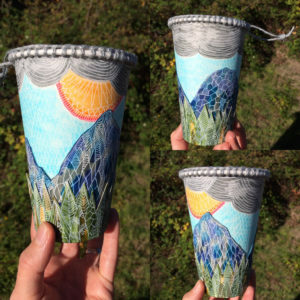 For this, all participants were to turn a 12-ounce paper cup into a piece of art. She also has a few sticker packs for iMessage available in the Apple App Store. 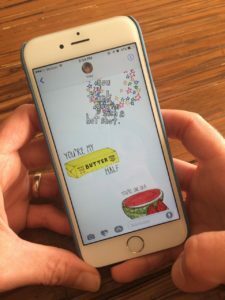 One of the sticker packs, titled “Puny Love,” has a coordinating set of physical postcards that can be found on her website. Her website has awesome pictures, coloring books and links to all her products. You can also keep up to date with what Trixy is working on by following her Instagram account. For Trixy, her art has always been inspired by nature. She spends as much time as she can outdoors, which is what makes Olympia perfect for her. Whether she is trail running, hiking or just taking a short walk downtown from her home in Olympia’s Eastside, she is constantly inspired by the nature of the region.